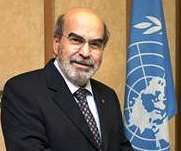 An international treaty known as the Agreement on Port State Measures (PSMA) to Prevent, Deter and Eliminate Illegal, Unreported and Unregulated (IUU) Fishing, has been commended by the Director-General of the Food and Agriculture Organisation (FAO), Mr. José Graziano da Silva, reports NaijaAgroNet. The PSMA, NaijaAgroNet gathered, according to da Silva, would soon have 48 parties, counting all 28 members of the European Union as one - with Japan and Montenegro about to join after having deposited their instruments of adhesion. “This gives the one-year-old treaty added heft,” Graziano da Silva declared, adding that he was very confident more countries will join in the near future. Speaking at the first meeting of the Parties, hosted by the Government of Norway to hammer out details regarding the implementation of the PSMA, Graziano da Silva said, noting that FAO-brokered treaty which restricts port access to fishing vessels that fail to comply with a set of rules, including proof that they have proper operating licenses and transparent disclosure of the species and quantity of fish caught. The PSMA represents the capstone of years of diplomatic effort to combat the scourge of IIU fishing, which amounts to up to 26 million tonnes, worth some $23 billion a year, and represents a huge threat to all efforts to bolster sustainable fishing in the world's oceans. NaijaAgroNet notes that parties to the PSMA currently account for more than two-thirds of the global fish trade.